Raise your hand if this has happened to you: You brought your car in for maintenance right on schedule, and then something completely different caused a breakdown a week later. At the time, you may have taken it to mean that your car mechanic was a hack. But the more likely reason is that your car was a victim of the random and unpredictable failure that often plagues machines. Recently, we considered reliability-centred maintenance (RCM) as one of four common maintenance types. It’s often cited as the most complex approach to maintenance, and for good reason. RCM is built on the idea that failure is not always linear. It requires careful analysis of each piece of equipment to identify all possible failure modes and determine the optimal time to carry out maintenance or inspections based on this data. Enter the most useful tool in RCM: The P-F curve. Set on an X-Y axis where X measures time and Y measures the condition of an asset, the curve aims to represent the behaviour of an asset before it actually fails. In other words, it predicts the condition of an asset based on what usually causes it to fail and when. 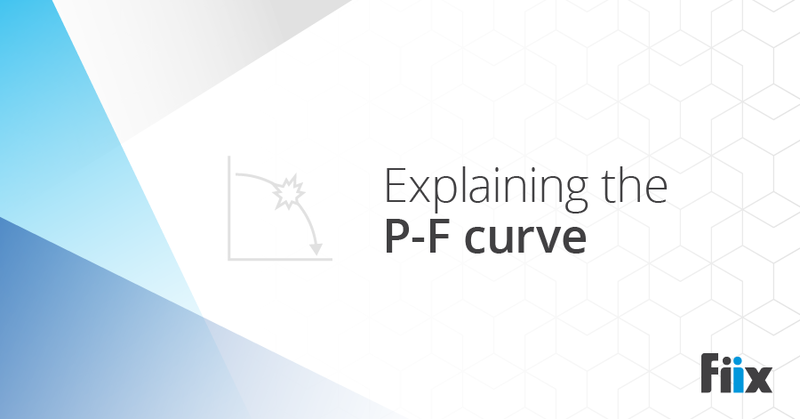 The “P” in a P-F curve refers to potential failure (when a piece of equipment could fail based on historical data, or the first point where we can detect that a failure could be occurring). To use an example, recording failures on a bearing could tell you that it typically fails after its temperature climbs above 60 degrees. Conversely, the “F” refers to an asset’s functional failure (when the asset actually fails). Continuing with the same example, you know that you typically have about four days between when the bearing’s temperature passes 60 degrees (P) and when it fails (F). Therefore, you should be inspecting it within that interval (perhaps every two days). This will ensure that you catch a failure before it actually occurs. Staving off failure with maintenance is often not as simple as doing the same inspection at a set interval. The P-F curve recognizes the complexity of this task, which is why it works so well. The method assumes that failure is a fairly random and unpredictable event, caused by the culmination of many factors. 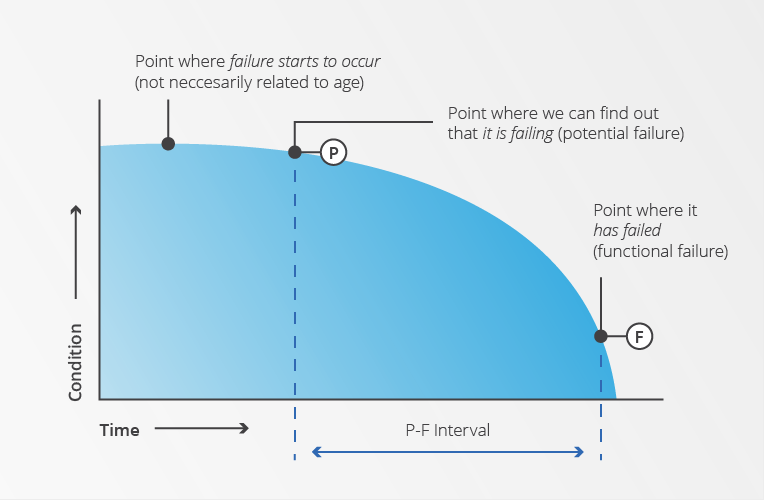 If you can detect the signs of failure and identify the amount of time you have before a functional failure, you can focus on making the P-F interval as long as possible with less frequent, but more accurate inspections. The bread and butter of the P-F curve is the P-F interval. This is the time between an asset’s potential failure and its functional predicted failure. Your inspection interval must be smaller than the P-F interval so you can catch a failure after it’s detectable, but before it actually occurs. Visual Inspection (look, listen and feel). As you can see, these are all tasks that require a great deal of training and expertise. This is one of the main reasons why RCM is considered complex. Yes, reliability-centered maintenance is complicated, but it can have a big payoff if done right. Setting up a framework where inspections are carried out according to a specific asset’s failure modes undoubtedly improves reliability. When the P-F curve is considered and used correctly, reliability-centered maintenance is absolutely within your reach.